The living martial arts legend Jackie Chan makes his long awaited return to action cinema when 'Dragon Blade' hits Blu-ray and DVD from March 14th, 2016, courtesy of Signature Entertainment. So, as you might have guessed after reading the title of this post, to celebrate Jackie's return Signature has allowed me to give away three copies of this film. 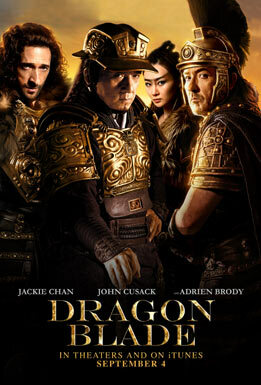 Alongside Jackie we can also expect to see John Cusack (High Fidelity), who plays a Roman General named Lucius that marches his legion of men across ancient China, circa 48 BC, so they can fight off Tiberius (a character played by Adrien Brody), who's on a quest to kill his younger brother. 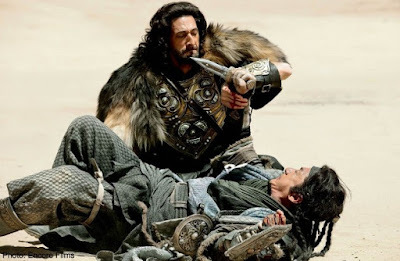 Basically, Dragon Blade is a sword and sandals epic about honor, discipline, synchronized marching, family feuds, and of course, drama, action, and pathos. Furthermore, I best mention that you have to submit your entry by midnight, on the 3rd of April, 2016, Greenwich Mean Time, and that you have to be living in the UK to enter. OK. So have you got all that? Good. And good luck to you too.